Nothing says “summer” like frozen treats. Ice cream (is anything more delectable? 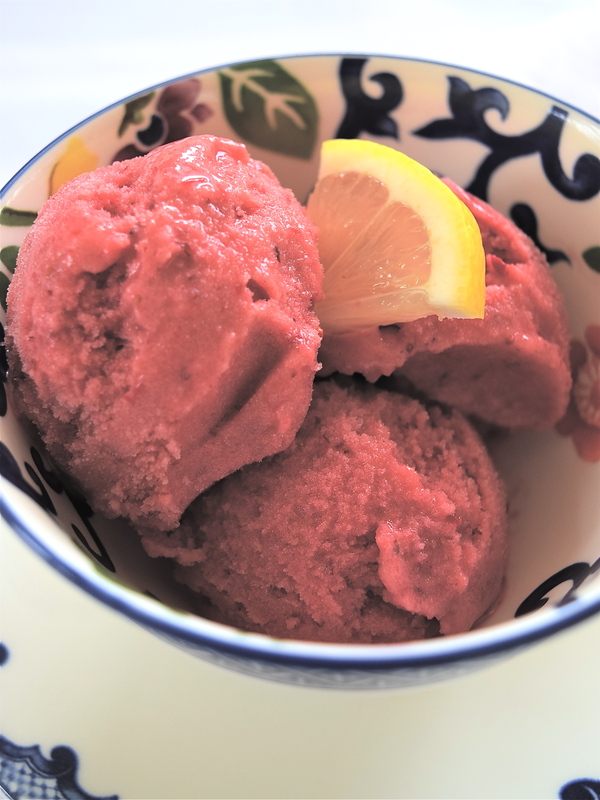 *), sorbet, granita, gelato, and – of course – frozen yogurt! Like most people, I discovered frozen yogurt at the mall. I think I was about six years old when my dad bought me a raspberry frozen yogurt from Yogen Früz… and I was hooked. It was truly the perfect combination of sweet and tart. Don’t get me wrong: I love traditional, creamy, sweet ice cream. But there’s something about the *zing* of citrus or berry frozen yogurt that appeals so much to my taste buds. So, a few weeks ago I came across this recipe for 5-minute (Healthy) Strawberry Frozen Yogurt and it inspired me to try making my own version! 1. Put the lemon juice, honey, and yogurt into your food processor and process until blended. 3. Store your frozen yogurt in an air-tight container in the freezer. Freeze until serving, at least 3 hours. 4. 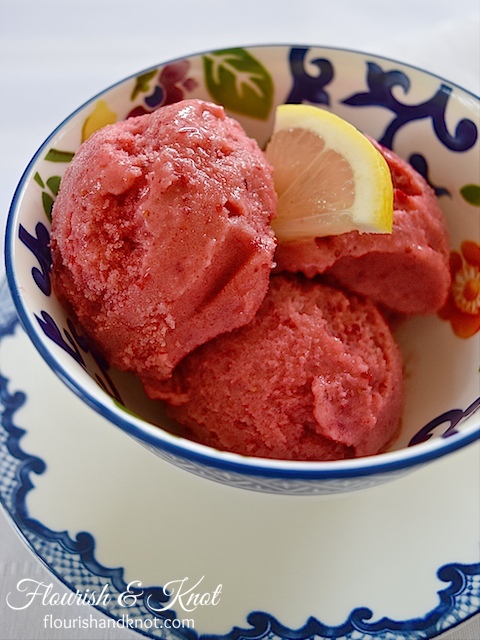 If your frozen yogurt is too solid, microwave on low for 30 seconds or allow it to warm up a bit at room temperature. So which type of frozen treat is YOUR favourite? Do you like the sweetness of ice cream or the tartness of frozen yogurt? *1 000 000 points to you if you got that musical theatre reference! Let me know in the comments! This post was featured at Katherine’s Corner and Home Stories A to Z! You need to puree this in a Vitamix!! 🙂 LOVE the color- sounds tasty too! Popping over from Merry Monday =) Looks delicious! LOve that beautiful color & it must taste really zingy! Thank you for sharing at FF! Yummy! It was 102 yesterday and is going to be just as hot today. Might have to make this because truly my life depends on it! It will definitely make a hot day more bearable! You Wowed me with the cranberry/strawberry combo! This looks so delicious! Would love for you to share this at the #OhMyHeartsieGirlsWW. I pin, tweet and share! Hope you can join us! Have a terrific week! Thanks for sharing my post. The strawberry-cranberry combo really is super refreshing! Try it: I think you’ll like it. Cranberries so often get relegated to Christmas and Thanksgiving… Poor them! Thanks! Glad to discover a new link party. Thanks so much, Katherine! I’ll look forward to it! Looks so yummy! Thank you for sharing at Pin Worthy Wednesday! Looks good. I am going to make some this week. Thanks for the recipe. It really is good! I hope you enjoy it. I have to try this recipe! And I will be careful with the blender. 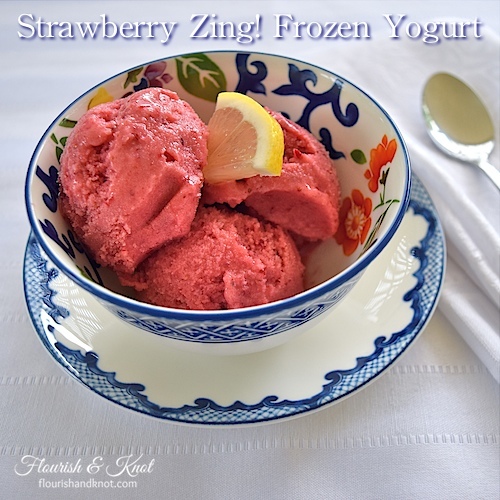 This frozen yogurt looks refreshing and the color is great! Thanks for adding your flair to the #funsummerfinds linkup! Sounds fantastic! I’m not a huge ice cream fan, but love sherbert. I even remember picking sherbert over ice cream when I was a kid. I bet I would love this yogurt! 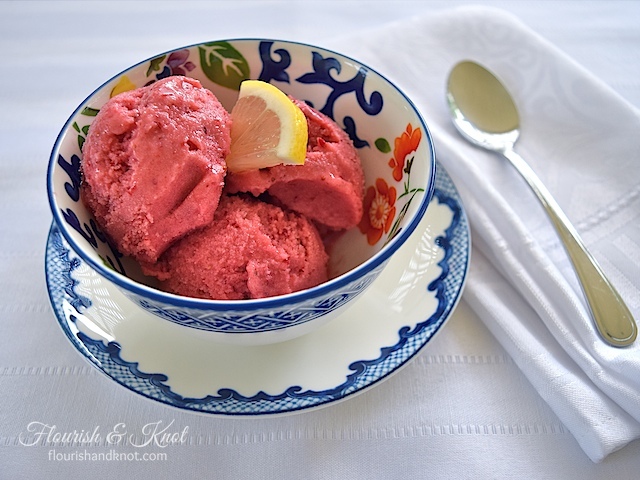 I always pick the fruit sherbet or yogurt over super-sweet ice cream! That looks delightful, delirious, delectable, de-looooovely. I sang that song in “Anything Goes” in high school. There were a lot of “de-” words and I’m pretty sure “delectable” was part of the list. Am I right? Good guess, Kim, but no, it’s not a reference to “Anything Goes”! LOOKS GREAT!!! YUM!!!! 🙂 Pinned! Yum, this looks so refreshing! Looks amazing! Love your dishes too! Thanks! They’re Ralph Lauren and we got them as our wedding china.